Reusable grocery bags (let’s call them “RGBs”) are a common commodity these days. I use them regularly and machine-wash them periodically with bleach, when possible, to keep them clean and sanitized. Using RGBs involves a degree of extra effort, not the least of which is remembering to take them to the grocery store, but I appreciate the environmental benefits of my decision. I was interested, therefore, in a recent study that sheds light on the potential for contaminated RGBs to spread viruses where we shop for food. Norovirus is the leading cause of foodborne illness in the US. Known as the “perfect pathogen” because of the ease with which it spreads from person to person, norovirus evolves rapidly before immunity can be built up by affected populations. The virus is a major concern in the food production, service and grocery retail industries, according to a team of researchers from Loma Linda University. Their study, “The Spread of a Norovirus Surrogate via Reusable Grocery Bags in a Grocery Supermarket,” explores the potential for contaminated RGBs to spread viruses to surfaces within a public grocery store. The research team recruited volunteer shoppers in front of three California grocery stores and instructed them to complete their planned shopping trip using a polypropylene RGB provided by the researchers. The dry bags had been sprayed previously with a solution of a safe norovirus surrogate, known as “MS2 bacteriophage,” or just “MS2.” The solution concentration was similar to that of norovirus from an infected person’s bodily fluids. As volunteers shopped, the surfaces they contacted were swabbed by the research team for microbial analysis. Results indicate that in addition to the “seeded” RGBs, the highest concentration of MS2 was found on the hands of clerks and volunteer shoppers, followed by packaged food surfaces and progressively lower levels on 12 other grocery store surfaces. These include unpackaged produce, cart surfaces and the customer checkout touch screen. Importantly, even the lowest average concentration of virus particles detected on any surface in the study (10,000 PFU1/cm2) would represent a virus transmission risk for most individuals. I am so glad that almost all grocery stores now provide hand-sanitizing wipes to use on carts. Given the fact that hands were the most contaminated surfaces in this study, I agree with the researchers that in-store hand hygiene campaigns are needed. Perhaps the most we can hope for are hand-sanitizer dispensers at the check-out stands for use by the clerks and to wipe off the touch screen, although hand sanitizers may not be as effective against norovirus, for example, as soap and water. If, as demonstrated by the California study, our RGBs are truly a potential source of viral contamination, perhaps we need a public campaign to encourage grocery shoppers to wash and sanitize these bags periodically. 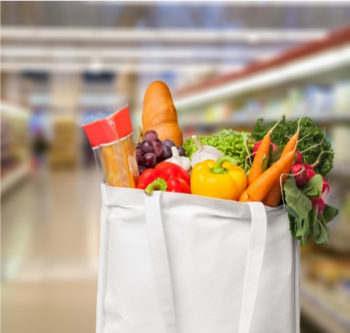 Additionally, shoppers (and in-store baggers) can be encouraged to take common sense measures to avoid cross-contamination by separating raw meats, poultry and fish from ready-to-eat foods, such as fruits and vegetables as they bag purchases. I use designated bags for these items, and I make a practice of keeping a few lightweight fabric bags in my purse for non-food products, such as drug store purchases. A little planning and raising awareness can go a long way toward preventing the spread of foodborne illness through contaminated RGBs.